What’s almost 40 years old but looks brand new? Believe it or not, it’s 3D printing. Yep, additive manufacturing technology has been around since the Reagan era. Here’s a brief tour through the history of 3D printing. In 1981, Hideo Kodama of Nagoya Municipal Industrial Research Institute published his account of a functional rapid-prototyping system using photopolymers (more on those in a minute). A solid, printed model was built up in layers, each of which corresponded to a cross-sectional slice in the model. Sound familiar? Three years later, in 1984, Charles Hull made 3D-printing history by inventing stereolithography. Stereolithography lets designers create 3D models using digital data, which can then be used to create a tangible object. The key to stereolithography is a kind of acrylic-based material known as photopolymer. Hit a vat of liquid photopolymer with a UV laser beam, and the light-exposed portion will instantly turn into solid piece of plastic, molded into the shape of your 3D-model design. Needless to say, this new technology was big news to inventors, who could now theoretically prototype and test their designs without having to make a huge upfront investment in manufacturing. 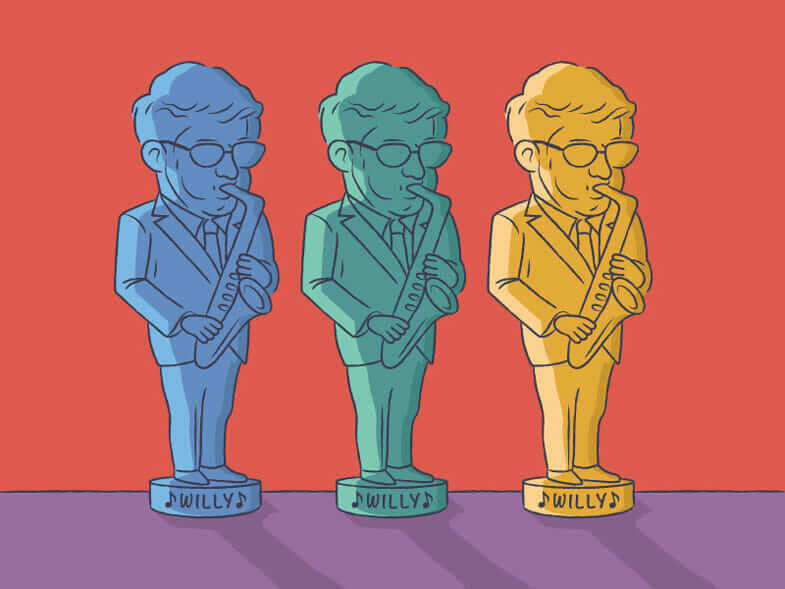 In 1992, Bill Clinton played sax on The Arsenio Hall Show—and 3D Systems (Charles Hull’s company) created the world’s first stereolithographic apparatus (SLA) machine, which made it possible to fabricate complex parts, layer by layer, in a fraction of the time it would normally take. That same year, startup DTM produced the world’s first selective laser sintering (SLS) machine—which shoots a laser at a powder instead of a liquid. These technologies were in their infancy and weren’t perfect; there was some warping in the material as it hardened, and the machines were prohibitively expensive for home inventors, but their potential was undeniable. 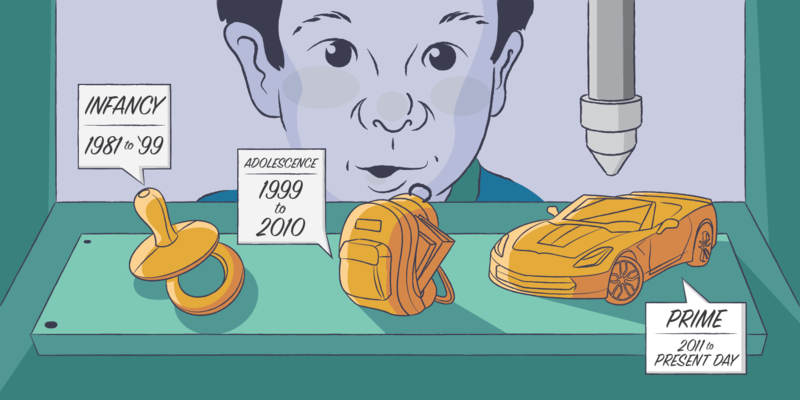 Decades later, 3D-printing history has shown that this potential is still unfolding. The lead-up to Y2K was thrilling—not only because, in 1999, the original Beverly Hills 90210 entered its last season on the air but also because the first 3D-printed organ was implanted in humans. Scientists at Wake Forest Institute for Regenerative Medicine printed synthetic scaffolds of a human bladder and then coated them with the cells of human patients. The newly generated tissue was then implanted into the patients, with little to no chance that their immune systems would reject them, as they were made of their own cells. Medically speaking, this was a great decade in the history of 3D printing. In just 10 short years, scientists from different institutions and startups fabricated a functional miniature kidney, built a prosthetic leg with complex component parts that were printed within the same structure, and bioprinted the first blood vessels using only human cells. This was also the decade when 3D printing met the open-source movement. In 2005, Dr. Adrian Bowyer’s RepRap Project launched an open-source initiative to create a 3D printer that could basically build itself—or at least print most of its own parts. Its 2008 release, Darwin, is a self-replicating printer that’s able to do just that. Suddenly, people everywhere had the power to create whatever stuff they could dream up on their own (see also: Kickstarter, which launched in 2009 and has since crowdfunded countless 3D-printing-related projects). 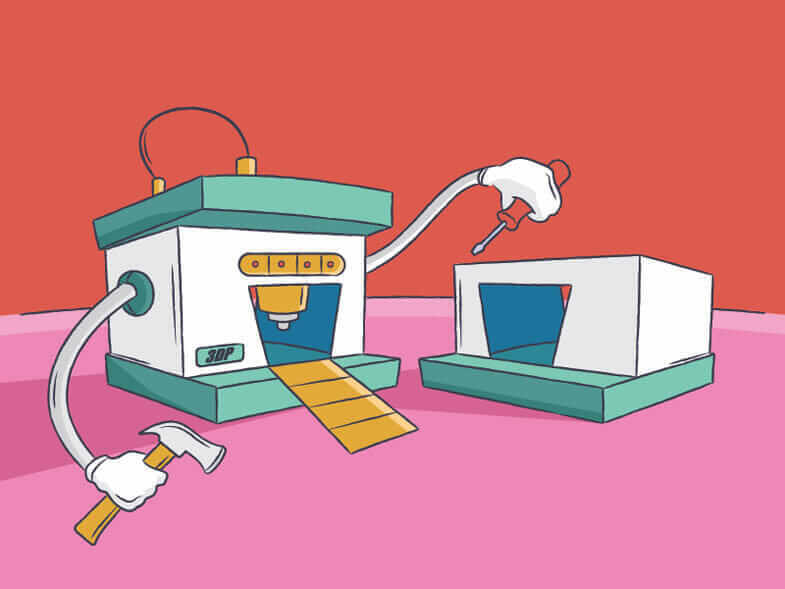 By the mid-2000s, the democratization of manufacturing had captured the public’s imagination, as had the idea of mass customization (which, unlike jumbo shrimp, is not actually an oxymoron). The first SLS machine became commercially viable in 2006, which opened the door to on-demand manufacturing of industrial parts. 3D-printing startup Objet (now merged with Stratasys) built a machine that could print in multiple materials, which allowed a single part to be fabricated in different versions, with different material properties. The intensely creative innovations of the decade were topped off with the launch of collaborative co-creation services such as Shapeways, a 3D-printing marketplace where designers can get feedback from consumers and other designers and then affordably fabricate their products. As the cherry on top, MakerBot hit the scene, providing open-source DIY kits for makers to build their own 3D printers and products. At this point, the barriers to entry for designers and inventors were falling every day. Today, looking back over just the past few years, it’s hard not to feel like humans are living in the future. Coming soon: 3D-printed jetpacks! Well, almost. While the price of 3D printers has fallen rapidly and the accuracy of 3D printing has improved, innovators are pushing the envelope in ways that Charles Hull could only dream of. Designers are no longer limited to printing with plastic. Case in point: You can now print the engagement ring of your dreams using gold or silver. Engineers at the University of Southampton have flown the world’s ­first 3D-printed unmanned aircraft, and KOR Ecologic prototyped Urbee, a car with a 3D-printed body that’s built to get 200 mpg on the freeway. Beyond jewelry and aircraft, 3D printing is now being used to manufacture affordable housing for the developing world, and visionaries have begun to employ the technology to print everything from smart robotic arms, bone replacements, and even particles just a few atoms thick (which could result in even smaller electronics and batteries). That takes 3D printing to the present day—although by the time this article is published, there will surely have been countless other notable moments in 3D-printing history made worldwide. It’s almost impossible to keep up. In the future, kids will build art projects with their classrooms’ 3D printers, and dentists will be able to call in prescriptions for custom-printed sets of dentures. In the meantime, keeping watching the news and waiting for that jetpack. 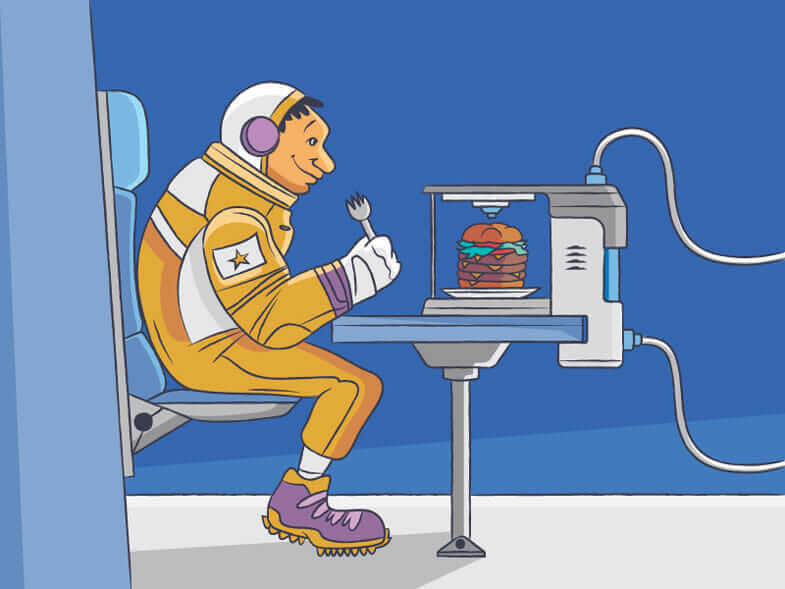 NASA is a major proponent of 3D printing—from food to the first zero-gravity 3D printer in space. There’s a 3D printer on the market (the Photonic Professional GT) that can create objects no wider than a human hair. Louis DeRosa used a 3Doodler—the 3D-printing pen made famous by netting $2.3 million on Kickstarter—to create a working hexacopter-framed drone. This article has been updated. It was originally published in September 2014.